QR Codes are already used in variety of ways, but few of them are more catching the attention and engaging than video. 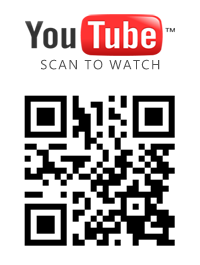 Everyone know YouTube and know it is the biggest video site on the Web so linking QR Codes to videos from YouTube is essential. That is the reason I want to explain you how to do it with our generator without mistaken something. and you have to copy the underlined in red. If there is something more after the video ID which in the current case is vI_y7nCCd0g just delete it, and after that copy the URL. User URLs are in one format every time and you have nothing to edit there, just copy it. When this is done we have a simple solution to create a video QR Code and your first step in to Sign Up for YouScan.me account. After this you have to open your Dashboard and select Social & Video tab. Enter a title for your QR Code and proceed down to adding actions. On the left is YouTube and after selecting it you have 2 options to select from. 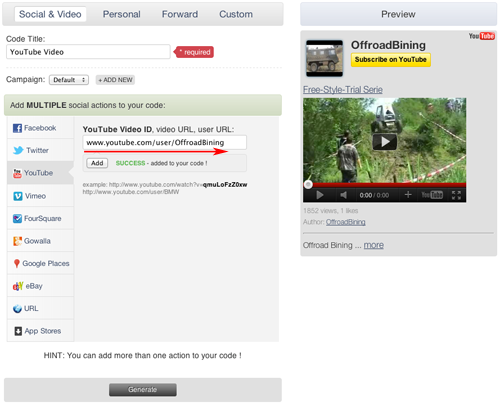 Embed single video or embed user profile with all videos uploaded from it. 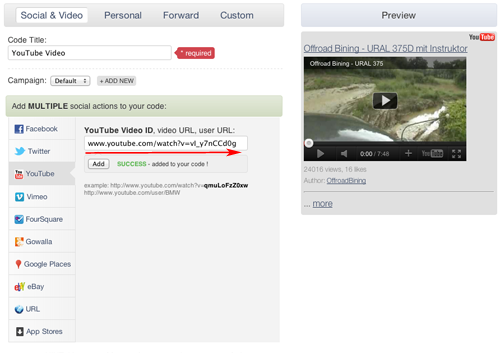 Here are screenshots how it must appear in order to embed the video correctly. Notice that you have Preview on the right, which indicates how you are doing with inserting actions to your QR code. If your desired video or user profile appears there everything is OK and your just need to hit the Generate button to have your Video QR Code. Using video in QR Codes is strong way to attract people and present them your services, products, entertain them with related content and many more. And we offer you this for Free.